What better way to celebrate Easter than with the candy-colors of springtime? Think you're too old for an Easter basket? Think again! Order a lush basket of Easter flowers from Belding Daisy Floral for yourself or any bunny who needs a little pick-me-up! Whether your style is bright and cheery gerbera dasies, or powdery pastel lilies, this Belding florist has you covered! Administrative Professionals Day (AKA Secretaries Day) is the time when those in charge show appreciation to their staff for all they do to keep everything running smoothly. Let's face it, without a good team behind you it would not be business as usual! Let us deliver the best in administrative professionals day gifts to your staff -- from beautiful flowers to gift baskets filled with yummy snacks, you can't go wrong with Belding Daisy Floral! Send mom your love this year through a beautiful bouquet of her favorite flowers. Mother's Day is your time to show mom just how much you appreciate her and everything she has done. Let Belding Daisy Floral help you say "Thinking of you, mom" and "I love you always" with flowers -- no matter if you live here in Belding, or across the country. Simply click any of the beautiful Mother's Day flower arrangements above to order online! Thanksgiving activities will soon be starting. Give the holiday recipe a dash of autumn color by sending flowers online or shop for Thanksgiving table decorations, creative centerpiece ideas, and more at your local Belding flower shop, Belding Daisy Floral! Brighten your Thanksgiving turkey dinner with unique floral arrangements, like a table centerpiece for the host, cornucopia fruit baskets, contemporary floral vases or baskets of fall flowers. Let your holiday florist, Belding Daisy Floral in MI bring warm smiles from across the miles at this year's Thanksgiving celebration! Sometimes the best way to show your boss just how much you appreciate their fine leadership is by sending flowers. With a National Boss Day gift of flowers from Belding Daisy Floral, your boss will know exactly how you feel. Everyone wants a raise. Raise your boss's spirits this Boss Day with one of the many colorful flower arrangements from Belding Daisy Floral in Belding, MI. Sweetest Day is like a mix between Valentines Day and Thanksgiving. It’s a day to give thanks for those extra-sweet people in your life. The holiday originated with a candy store owner who wanted to bring cheer and some happiness to the lives of those who were often forgotten. A great way to celebrate Sweetest Day is by ordering a gift basket of sweet treats from Belding Daisy Floral for your someone sweet. Halloween brings out the kid (and 'spook') in all of us with jack-o'-lanterns, trick-or-treating, and lots of Halloween activities to enjoy. Your local florist, Belding Daisy Floral of Belding, is a great place to start for creative suggestions on Halloween flowers, party decorations, and haunted houses. Let us suggest some Halloween party flower ideas for kids, and maybe even a few tips grownup 'ghouls' will like too! Give your Halloween festivities a 'frightfully' fantastic look and feel with colorful flowers and fun Halloween floral decor from Belding Daisy Floral. 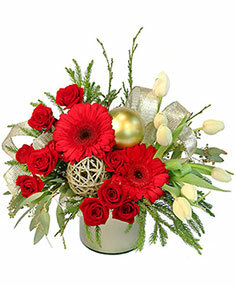 Christmas flowers from Belding Daisy Floral in Belding, MI are the best way to send Christmas cheer! Flowers and poinsettia plants are a great way to spread joy throughout the season, but also make quick and easy party decor. Belding Daisy Floral can help you with any Christmas styles or colors with our Christmas decor accessories. Need a centerpiece or a Christmas wreath for your party? Belding Daisy Floral has it, and more! Roses are always a great, classic way to say 'I love you' while a bouquet of your loved one's favorite flowers is always perfect on Valentines Day. Sending roses is always a special occasion. Let Belding Daisy Floral help you send this traditional romantic gift. They are also one of the most popular and recognized flowers in the world. No matter who you want to send flowers to, roses are a perfect choice. Send red roses for romance, white roses for respect, and yellow roses for friendship. Whatever rose you choose to send, Belding Daisy Floral in Belding can help you!